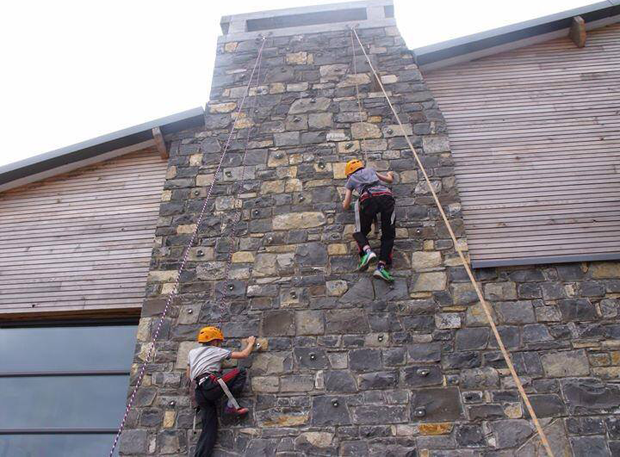 Chimney climbing is a recreational activity consisting of ascending the chimney of the centre (on the outside wall). The technique used is similar to that used on artificial climbing walls. Children and youth of all ages over 9 years can now do it safely, instructed and with ropes and safety gear. Mixing rock climbing techniques by using the hand holds, getting to the top, overlooking the campsite, you then get a chance of honking that horn at the top. Balance, confidence and pushing yourself to the limit are all key to this activity! But don’t worry you are attached to a rope and won’t fall anywhere! A great team builder that everyone can join in with, even if you don’t want to climb, you can help by “spotting” for your friends and looking out for them and their next hand and foot holds. All long hair tied back in a pony tail and free from potential of catching in the harness. All safety equipment to be worn under strict guidance from the instructor. Comfortable shoes to be worn, we recommend a pair of runners as they are flexible and allow for more grip on the wall.